Sorry, these dangle Connemara marble earrings are now sold out. 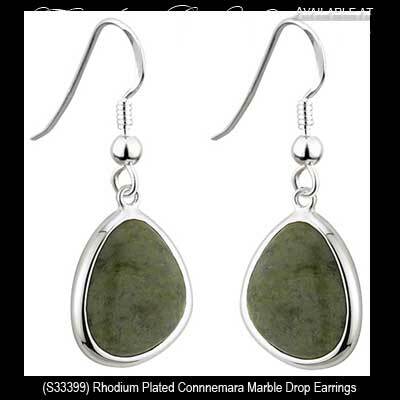 These Connemara marble earrings are a wide design that features Ireland's gem stone in the center and they are enhanced with a rhodium plated finish. The plated Connemara marble earrings are a drop style on fish hook wires that measure 5/8" wide x 1 3/8” tall, from the bottom to the top of the wire.